Created in 2018, this course is a brilliant way to focus for the New Year! Register for free 3 week access or purchase permanent access for you and a friend. It's my experience that we all talk a lot about priorities, but mostly in a superficial way. What we REALLY want is an excuse to dig a little deeper and find out some new information. With that in mind I created this 8 part journal buffet at the beginning of 2018. And when the new year rolled back around I found it just as potent for 2019! If you've taken a course with me before, the format will be familiar. 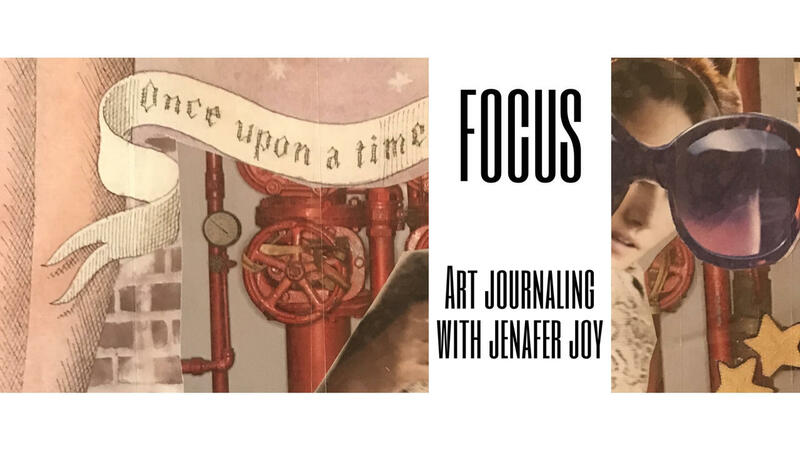 We'll be doing fast and furious writing, doodling and digging for connections, collaging in a couple different ways, word spelunking, and dabbling in paint to seal in the truths of what we've learned. Basically I'll be using all my favorite tricks to support you in sneaking up on yourself so you can hear what you have to say! And when you're complete, you'll also be completely clear on your true priority. I try to keep my supply list limited and the same for all my art journal courses. Find it here. With your registration you'll receive immediate access to the 8 prompts and an invitation to share with us in the Facebook Group during January. I designed this course in to be done as a prompt a day but recently loved doing it in three stages over a holiday weekend. Find your True Priority... three week free access!